Do you have ideas and aspirations, but aren't sure where to go or how to proceed? This informational and engaging workshop may spark your passion into a reality. 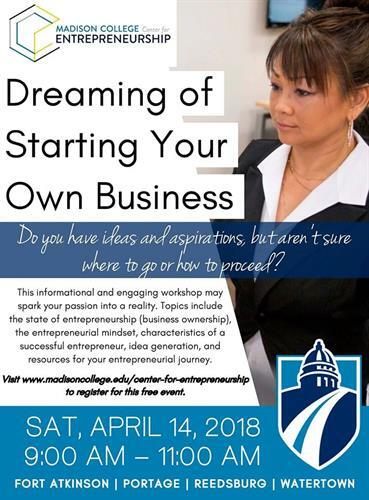 Topics include the state of entrepreneurship (business ownership), the entrepreneurial mindset, characteristics of a successful entrepreneur, idea generation, and resources for your entrepreneurial journey. This event will be available via telepresence in Portage room 123, Reedsburg room 130, Fort Atkinson room 109 and Watertown room 161. Presenter will be at Portage location.